It's almost time for the release of the next WoW expansion, which means that it's time to take a look at the shiny new collector's edition. If there is one thing that PC developer Blizzard is known for, it is its (name-appropriate) glacial development speed. If there are two things that Blizzard is known for, it is its glacial development speed and having some really cool collector's editions of its games. Â· Art of the Cataclysm art book, featuring 176 pages of never-before-seen images from the archives of the Blizzard Entertainment cinematics department and the World of Warcraft development team, as well as progressive visuals from multiple stages of development. Â· Exclusive in-game pet: he may not be a breaker of worlds just yet, but Lil' Deathwing will still proudly accompany heroes on their struggle to save Azeroth from his much, much larger counterpart. Â· Behind-the-scenes DVD with over an hour of developer interviews and commentaries, as well as a special Warcraft retrospective examining the rich gaming history of the Warcraft universe. Â· Soundtrack featuring 10 epic new tracks from Cataclysm, including exclusive bonus tracks. Â· Special-edition mouse pad depicting Deathwing menacing the ravaged continents of Azeroth. Â· World of Warcraft Trading Card Game cards, including a 60-card starter deck from the Wrathgate series, two extended-art cards, and two Collector's Edition-exclusive hero cards, marking the first appearance of goblin and worgen heroes in the TCG. So, let's see. In-game pet (awww, who's a cute widdle apocawypse dwagon? You are, yes you are! ), art book, behind-the-scenes DVD, soundtrack, TCG cards and a special new mousepad. 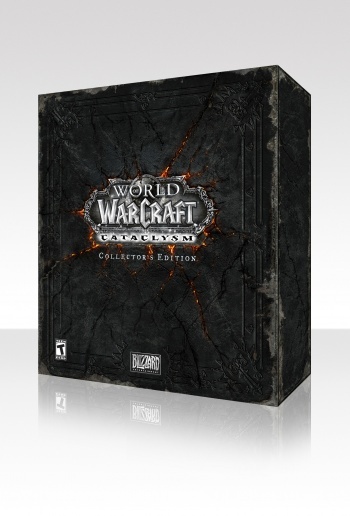 Yeah, that's a Blizzard collector's edition, all right. It's not as cool as the original StarCraft on a USB dog tag, but then again, what is? The collector's edition will cost you $80 should you decide that the beautifully understated box art is worth it. If Cataclysm has your interest piqued, well, we've got an entire issue on the subject matter this week. Boy, that's one hell of a coincidence, huh?